One of Terra Rossa's best-selling gift packs is its Exquisite Olive Oil Pack presented in a traditional Jordanian bag, providing the perfect introduction to some of the finest olive oils in the world. This not only includes the top of the range Sinolea cold-dripped and unfiltered extra virgin olive oil but also the first cold-pressed olive oil as well as one of each of the most delicious Basil, Chilli, Garlic, Lemon and Mint infused oils. Of course, if you prefer to keep to the sweet Easter treat tradition, then Terra Rossa has a great selection of gift ideas too. Manna from Heaven is a unique Middle Eastern sweet actually mentioned in the Bible. Made from the resin of trees which grow only in the north of Iraq and combined with mixed almonds, pistachio nuts and cardamom, Manna from Heaven is presented in a beautiful, traditional Jordanian Bag, making it the perfect gift for loved ones - and on special offer at just £5.95 until 27 March, an original alternative to chocolate eggs. 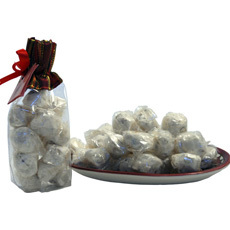 Sugar coated almonds, also known as Jordan Almonds have been given as wedding favours for more than 3,000 years with the bittersweet flavour of the almonds with the sugar coating signifying the hope that sweet will outweigh any bitter in the newlyweds' life. 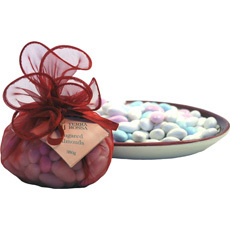 This message is also perfect for Easter and Terra Rossa's 250gm pack presented in a fine organza bag is just £4.95. Alternatively, why not try a gift pack containing two delicious varieties of traditional Jordanian Nougat with pistachio and apricot skin - or if you really can't decide, why not push the boat out with an 850gm Jordanian Assorted Sweet Bag. The ultimate treat containing a mix the very best sweets that Terra Rossa has to offer - and just for Easter, half price at £12.95.